On Offer: 189.3 gram Canyon Diablo Meteorite full individual as found. "The Canyon Diablo meteorites include the many fragments of the asteroid that created Barringer Crater (Meteor Crater), Arizona, United States. Meteorites have been found around the crater rim, and are named for nearby Canyon Diablo, which lies about three to four miles west of the crater." Canyon Diablo iron meteorite fragment (IAB) 2,641 grams. Note colorful natural desert patina. 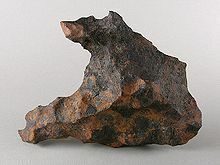 The Canyon Diablo meteorites include the many fragments of the asteroid that created Barringer Crater (Meteor Crater), Arizona, United States. Meteorites have been found around the crater rim, and are named for nearby Canyon Diablo which lies about three to four miles west of the crater. The asteroid fell about 50,000 years ago. The meteorites have been known and collected since the mid-19th century and were known and used by pre-historic Native Americans. The Barringer Crater, from the late 19th to the mid-20th century, was the center of a long dispute over the origin of craters that showed little evidence of volcanism. That debate was settled in the 1950s thanks to Eugene Shoemakers' study of the crater. In 1953, Clair Cammeron Patterson measured ratios of the lead isotopes in samples of the meteorite. The result permitted a refinement of the estimate of the age of the Earth to 4.550 billion years (± 70 million years). Kamacite iron nickel alloy - the most common component. 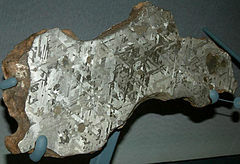 Trolite - a variety of the iron sulfide mineral pyrrhotite. The troilite in this sample is used as the standard reference for sulfur isotope ratios. Moissanite - a variety of silicon carbide, the second hardest natural mineral. Samples may contain troilite-graphite nodules with metal veins and small diamonds.